In Sanskrit, ‘Datta’ means ‘given’, and whatever is already given to all of us is Grace. Lord Shri Dattatreya is the universal Master, Nature and Grace. He is the trinity of Lord Shri Brahma, Shri Vishnu and Shri Mahesh; creation, sustenance and transformation. The human brain has three sections, which correlate to the above concept. So, devotion to Lord Shri Dattatreya works on the individual’s brain. Also, the pituitary and pineal, the master glands, are just in the area between the eyebrows where the spiritual third eye centre is located. In Kaliyuga, that is the present time, Lord Shri Dattatreya is the saviour and He offers worldly prosperity and spiritual consciousness. He is also ‘smartrugami’, which means that one only needs to remember Him for contact. He is like Mother Nature, offering complete protection and nourishment. Lord Shri Dattatreya is the son of the Seer Atri and his wife Anasuya, symbolizing friendliness and freedom from comparison, jealousy and demands. He is accepted as the first world Master from whom all the branches of meditation and tantra have emerged. The Gods only control specific dimensions and energies, while the Master is beyond, and even the Gods seek His blessings. 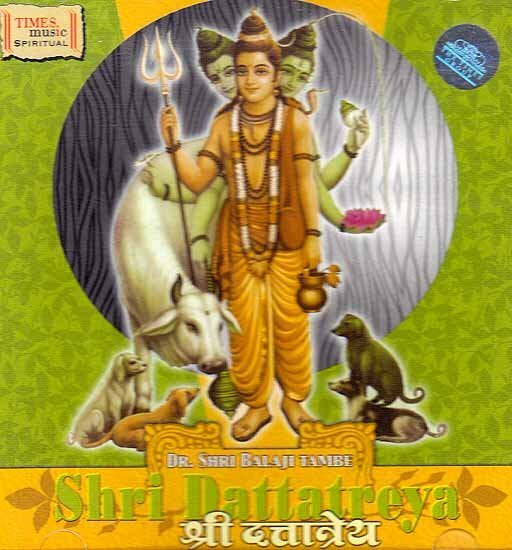 Lord Shri Dattatreya, the Master, is the main deity for all those spiritual aspirants longing for Moksha/Nirvana. The texts and musical compositions have been specifically selected to suit the energy of Lord Shri Dattatreya, the universal Master, and the third eye centre. Dr. Shri Balaji Tambe was born in India and has graduated as an Engineer and Ayurvedic doctor. He is married to Dr. Smt. Veena Tambe. He is the founder and source of inspiration of ‘Atmasantulana Village’, the largest internationally renowned Ayurvedic medical centre in India. Chronic diseases such as diabetes, high blood pressure, heart ailments, asthma, cancer, etc. are successfully treated at the centre. Dr. Shri Balaji Tambe is a gifted versatile artist, whose concerts in India and Europe always attract large audiences. Throughout the ears in which Dr. Shri Balaji Tambe has been practicing meditation and working as an Ayurvedic doctor, the music has emerged as an expression of his inner self. Later on, the music was recorded and used for research purposes. The scope of Ayurvedic therapies is greatly enhanced by the focused use of music, which gives remarkable healing results. Lord Dattatreya personifies the mighty trinity of Lord Brahma, Lord Vishnu and Lord Shiva – the Guru of all gurus, the all powerful link between Good and man, between creation, sustenance and destruction. Just like the Supreme Brahman, assumed the form of Dattatreya and from that form came out the three letters A. U, M – so also does Lord Dattatreya assume the form of intelligence in all mankind, Devotion to the Lord helps develop intelligence and a philosophical bent of mind. Recorded & Mastered by Sunil Tambe at Atmasantulana Village Studio, Karla 410 405, India.